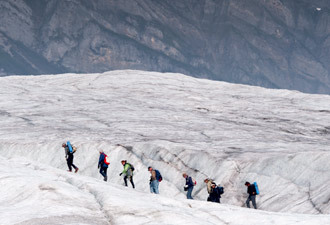 Discover adventure on a grand scale at Wrangell-St. Elias National Park and Preserve. It's hard to picture a more perfect Alaska wilderness. Filled with mountains, glaciers, and wild rivers, Wrangell-St. Elias is bigger than the states of Vermont, New Hampshire, and Rhode Island combined! With more than 13 million acres, this is our nation's largest national park. Given the park's setting, the possibilities for adventure are endless. You might immerse yourself in the colorful history of Kennecott, float a wild river, cross an ancient glacier, or drive one of the park's two primitive roads. Whether you plan to tour a local community, overwhelm your senses on a scenic flight, or chart your own backcountry trek, be prepared to be amazed. 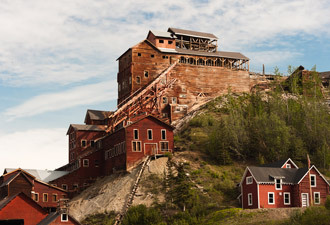 Visit the Kennecott Mines National Historical Landmark for an awe-inspiring journey to explore the remnants of an early 20th century engineering wonder. The 60-mile gravel McCarthy Road to the Kennecott/McCarthy area is a gateway to spectacular views and vast wilderness that is worth the effort. Not up for a bumpy ride? Try a panoramic flight along the Wrangell Mountain Range through the historic gateway town of Chitina. At Kennecott, you'll find impressive structures and artifacts from an era of Alaska exploration and westward expansion. You can ponder the history of World War politics, modernization, the rise of a multinational corporation, and most intimately of all, the people who lived here. The historic industrial town is picturesque, nestled deep within the Wrangell Mountains with the Kennecott and Root glaciers at its doorstep. A short distance away is the historic town of McCarthy — a turnaround station for the railroad and a supply and recreation community for the “dry” mill town in its day. Today this colorful remote community is a popular destination. The McCarthy-Kennicott Historical Museum, housed in the former train depot, chronicles the town's history. For visitors using the area as a jumping-off point for backpacking, hiking, and ice climbing, several experienced guide services coordinate adventures to the Root Glacier, the Jumbo, Bonanza and Erie mines, and the popular Donoho Basin area. For those looking to go farther into the wild, guided rafting and flightseeing trips are great opportunities to get out into the backcountry. Whatever your needs and budget, you'll find accommodations in the area ranging from well-established lodges and cabin rentals to bed and breakfast inns, hostels, and campgrounds. 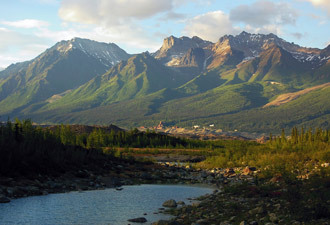 The Nabesna Road, leading to the northern reaches of the park, begins at mile 60 of the Glenn Highway (Tok Cutoff) and soon becomes gravel as it winds 42 miles into the park and preserve. You'll want to stop at the Slana Ranger Station for current road conditions and a free copy of the Nabesna Road Audio Tour for your journey. The drive takes you into the midst of the Wrangell, Mentasta, and Nutzotin mountains. Along the way, you'll find campsites, lakes and streams for fishing, hiking routes, and bird watching and wildlife viewing opportunities. Dead Dog Hill Rest Area is a popular stop for viewing moose and caribou. What you won't find are many people, so if you like taking the “the road less travelled,” the Nabesna Road may be right for you. When charting your own backcountry trek, be sure to stop by one of the park visitor centers or ranger stations for the most current information. To make your Wrangell-St. Elias adventure unique, check out the park's 14 public-use cabins, five of which can be reserved in advance. All cabins are in remote locations and some have airstrip access. Wherever your plans take you within the park, please learn and practice Leave No Trace principles, travel safely, and may your visit be one of many in a lifetime of exploration at Wrangell-St. Elias National Park and Preserve.